A.D. 1432 - The blood lines of six great houses come together in the greatest knight of them all. Prepare yourself for the beast. He bears the name of de Russe, but the bloodlines of six great houses converge in the greatest knight England has yet seen. As the grandfather of Gaston de Russe, the dark one, Sir Bastien de Russe beholds a great and terrible legacy - one that makes him both the target and the leader, the hunter and the hunted. His story is the most powerful of all. Greatness and darkness abide in the man known as the beast. I Will Listen To This One Again and Again!! Where does Beast rank among all the audiobooks you’ve listened to so far? It's definitely in my top five! Top two, if I had to base it on how much effort the narrator put into the story. What other book might you compare Beast to and why? I would compare 'Beast' to 'Guardian of Darkness.' Both were written by Kathryn Le Veque and both narrated by Brad Wills. The two stories are vastly different, but there are moments of great tragedy and poignancy in both. Everything! Come on, it's Brad Wills!!! The best of The Best!! Seriously, this book is by far his best effort! His range of emotion in 'Beast' was much wider. He read the voice of the 9-year-old king very well. As always, I was struck by how he can switch voices in a conversation and the pacing never lags. Imagine trying to read the male lead, the female lead and a child all in the same conversation without losing a beat! There were quite a few moments in this book that I thought were particularly moving. One moment was when Joan of Arc addressed the French people gathered at her execution. Another moment was when Bastian's wife screamed at him that she would hate him all the rest of her days. The part that really got me, though, was the entire portion following Sir Braxton's death. Grief-stricken at the news his father had died when their home had been invaded, Bastian raced home to ensure the welfare of his wife. When he burst into his father's chamber and saw him, and then got the reaction of his grieving and angry wife, he was just broken. When he continued, in tears, pleading with his wife to open the door and listen to him, he reached the end of his rope. By the time I listened through to the end of that scene, I felt gutted!! I will definitely listen to this audio again and again. Get it - you won't be disappointed! This is another great story by Kathryn Le Veque. I have not listen to a book by the author yet, that I didn't love. This is a non-stop listen. My husband and I stayed up to 3 in the morning listening to this book. This book is very entertaining. I liked how the young King is timid in the beginning, but starts to turn into a stronger king towards the end. Brad Wills does an excellent job with narrating, especially with young King Henry. This narrator was terrific. He had voices for everyone. The story was also quite good, I definitely like this writer. 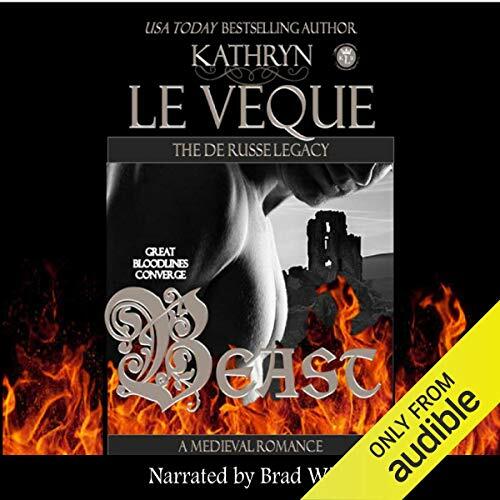 Would you consider the audio edition of Beast to be better than the print version? Yes! This was brilliant narrated. I found every emotion in the voice. It was done with a deep down feeling, with every word. Any that Brad Will's narrates. I found myself laughing out loud, crying and tensing every muscle at times because I was sucked right into this story with the voices. I did not have to wonder who the characters were. They each had their own voice. If you could take any character from Beast out to dinner, who would it be and why? An English Knight whom they called the Beast - Sir Bastian de Russe. He would protect me. This one is from a Master Story Teller and a Master Narrator. I LOVED IT!! I wish I could give it a 100 stars!! Brad Wills really does have a nice voice. Great story with a historical et political background. Like the way Little King Henry came out of his shell. Loved this story! Brad Wills is my absolute favorite narrator and did a fantastic job as usual! Kathryn does an incredible job building a romance off of an epic time in history. It has driven me to want to explore more into Joan. I was intrigued by the story line and found myself holding my breath at key moments in the narration. The romance was heart warming and even at times heartbreaking. Heavens, the being of the story alone takes you through a roller-coaster of emotions! I have so much to say but I don't want to be to telling and ruin in for another listener. This is by far my favorite book by Kathryn Le Vecque. If you are a fan of her writing, you will enjoy the lovely ending she has spun!! What better narrator t have then Bill Wills. He amazes me with his talented gift of giving life to achieve character. He is a master of his art. I always look forward to his telling of a story. I don't have the words to express my admiration and appreciation for his performances! Thank you again Mr. Wills for another delightful experience !